5) Baseball - Hard to be a big guy and break in, unless you're a pitcher. But once you're in, feel free to put on the feed bag. Been that way a long time, going way back to Babe Ruth. Modern day exaples include All-Stars like John Kruk, Tony Gwynn, Cecil (and now Prince) Fielder, and our own beloved Kent Hrbek. 4) Golf - Tim Herron and John Daly. Nuff said. 3) Football - Too many examples to mention, especially when every team has at least one guy that's nicknamed "big daddy." 2) Sumo - Fat guys. Diapers. Goes without saying. 1) Bobsled - Congrats, Steve. I envy your local Dominoe's franchise tonight. What is the Coffee Party REALLY About? In a recent article in the StarTribune featuring the Coffee Party, founder Annabel Park claims that the party is an extension of a desire for conversation. She's quoted in the article thusly, "We have to relearn how to talk to each other, to deliberate." Funny. Her original post on her Facebook page which kicked off this whole movement stated, "...how about (calling the group) cappuccino party? That would really piss 'em off because it sounds elitist." So, Ms. Park, is the group really about desiring to communicate, or merely desiring to "piss 'em off?" The most articulate and persuasive recap of why health care legislation, in its current configuration, is an economic nightmare. Why the reluctance to start over, component by component, and fix this thing the right way? As I was flipping around tonight, I happened to pass by MSNBC, and noted that Keith Olbermann was teasing one of his "special comments." Since his bombast is usually good for some high entertainment, I stuck around. Is this what we've come to - when our dying parents become props in our political screeds? There is a time and a place for this story. It's not now. It's not moving, or motivating, or brave, or whatever he was looking to accomplish. It was sick, repugnant, and shameful. It is 7 degrees this morning. Vacation is over. Work is burying me. Football is over. We're weeks from March Madness and MLB spring training. Taxes need to be done. Given all of that, if only Joe Mauer would just sign his damn contract, I'd feel a lot better. Served in one of the most beautiful beach bars you'll ever see, Nipper's wicked little concoction packs a wallop. Rum punch based, and served either frozen or over the rocks, either way will make for a fine day at the bar. Nipper's executes some last day heroics and leverages ambiance and cost/value to post an 8.7 out of 10, this tying the Wally Special. A tie-breaker will definitely need to be conducted. The weather proceeded to get a lot better with the wind dying down, so we made the long run to Great Guana Cay, home of the 3rd largest barrier reef in the world, and also home to one of the best island bars anywhere, Nipper's. Of course, the day that we needed top leave was the most beautiful, but we can't complain. We had an incredible week here in the Bahamas. I can't stress enough the natural beauty here. I've been to the Caymans, most of the Virgins, Cancun, and Hawaii, Marsh Harbour remains our favorite locale. The big blow from the NW did not cease yesterday, and again limited our options. We spent time on the boat looking for a perfect beach, and actually landed on one, only to pick up and move on back to Witch Point. We spent most of the early afternoon there and then headed over to the Abaco Inn for a late lunch and the best Pina Colada that money can buy. Today the wind finally died down, so we're looking to log some serious hours in the boat. Here's the sunrise that greeted us this morning. Last day. We can't wait to get going. Curly Tails, perhaps the nicest bar down here, serves up a frozen potable as their signature offering. Heavy on the fruit with mango and peach schnapps, it was a little too sweet for your scribe, but scored well with the rest of the team. Nice location. Bad drink. 4.0 out of 10. Huge NW winds kept the team confined to a narrow portion of big ocean yesterday. We made a shorter run to Witch Point and set up there as our beach of the day. Water temps were cooler, so there wasn’t any snorkeling that was executed, but we all got in some walks and numerous games of Ladder Golf. In fact, we were so into the games that we almost didn’t make it off the beach. Four of us were involved in a heated rematch that we decided to complete prior to heading to lunch. While we were engaged in that, Andy decided to do some clean up and get ready for our departure. She moved some bags to the boat, and then came to the quick realization that she could not move the boat – the tide had gone out so fast that a good portion of our trusty vessel was resting in the sand. We immediately pushed the panic button and all rushed to the water. The rate that the tide was going out, we had about 5 minutes to solve our predicament until we’d be stuck for good, or at least until the tide came back in, over 6 hours later. We showed good teamwork, freed the bow, leveraged the big winds, and ultimately got the stern floating as well. It took all six of us, but the crisis was averted. We headed off to Angler’s at the Abaco Inn for a well-deserved cocktail and a late lunch. Weather is similar today, although wind has let up some. We’re off to find another beach and do it all again. Except this time, we'll pay more close attention to the tides. The pre-contest favorite did not disappoint. Potency and presentation drove the day, as this rum concoction worked its magic once again. Results were an uncontrollable laughing jag by Betsy, and losing the girls for a couple of hours as they worked off their intoxication by shopping and walking. After tabulation, the Wally Special owns the #1 spot at 8.7 out of 10. Huge north winds kept the crew land side for most of the day. Given the sunburns of the previous day, taking a day off was not such a bad idea. The day was spent walking, shopping, cooking, reading, napping, and even a small cruise in the windless area was executed. We also spent a long, boozy lunch at Wally's. We're well rested, and given the sun that has met us this morning, we're going to need it. There have been dozens of these Hitler parodies - a number of them hilarious. The LSU coaching situation and the Howard Stern ones in particular were outstanding. Here's another great one, this time on the whole Global Warming - slash that, Climate Change - situation. Harbour's Edge weighs in with their entry, and it turns out to be a heavyweight. While not as strong as the Ting V, the presentation made in a real glass and the ambiance made this one tough to beat. We have a new leader in the clubhouse, folks. The Travel Caribbean™ crew score it a whopping 8.5 on a 10 point scale. It's going to be a tough one to beat, but we still haven't sampled the pre-contest favorite from Wally's, so the end result is still in doubt. Stay tuned. Instead of the party cloudy day that was forecast, we got the perfect day yesterday. We took our boat to our favorite island, and hung out there a good long time. While snorkeling was not as good as previous years, at least the water temperature was such that it could be accomplished. Weather today looks like a total bust, but given how sunburned many of us our, a day off may not be a bad thing. The first year we ever came down here, we happened upon a small pod of dolphins in our boat, and stopped next to them to watch. Since it happened to be Valentine's Day, Capt. Randy quickly presented the idea that we had arranged the dolphin show for our lovely spouses as a gift on the special day. Ever since, when we're down here over Valentine's Day, the ladies expect a dolphin show. The men totally got bailed out by a small pod that Capt. Randy spied off the deck. Snapping a photo of them was difficult, but I did get one with a fin to prove that we had come thorough yet again. We got into a powerful one at Coco Beach with the Ting V. It was concocted much like the Mind Snappa, but with a much bigger kick. Unfortunately, it lost marks for the 12 oz. plastic cup (boo!) and for the cost - a spendy $8.50. The Travel Caribbean™ crew score it a 6.5 out of 10. The championship is still up for grabs. The top layer of the hole, some 50 feet or so, is fresh water, and we found out later that salt water lies below. Marky, Andy and I snorkeled it, and the drop off to absolutely nothing is downright chilling. Despite its small size from the surface, it is freaky to see with mask and fins. As we were drying off and enjoying a fine Kalik Light, a Jeep happened to pull up with some scuba divers from a local dive shop. With the big winds, ocean dives in the agitated water would make things difficult to see, so a blue hole dive fit the bill. We watched them prepare then stood, mouths agape, as they disappeared into the blackness in a scant amount of minutes. All that was left were their bubbles. The dive master told us that he had heard that the bottom was about 250 feet, although he had also heard that bottom had never truly been seen. He believed the latter. Along the sides, though, were supposed to be some fabulous caves. A Valentine's Day dinner at Mangoes capped off a nice day. It sounds like the weather will be better tomorrow, which is good. We're all getting antsy to get on the ocean. First entry of the week goes to Snappa’s with their Mind Snappa. Multiple rums (including coconut, nice touch), Absolut, pineapple juice, other flavorings and a cherry garnish make this a solid entry. Main down side is that it is served in a 12oz. plastic cup, so for a thirsty crew that needed some relaxation post-travel, too many rounds needed to be ordered. Let’s give this one a 6.5 out of 10. After a full week of solid 14 hour days, the day for departure finally arrived. With a 6:10AM wheels up and needing to drop off the Yellow Dog at the dogsitter, that meant I was up at 2:30AM for shower, final arrangements, and hitting the road. Travel was uneventful. Despite a tough layover window of 1 hour in Miami, we arrived with plenty of time to spare. The cattle call that is the regional portion of the Miami International Airport was a bit of a nightmare, as evidenced by this picture of the team, collectively trying to stay out of other travelers’ ways. A big north wind made the flight to Marsh Harbour a bit of a roller coaster, and Andy felt the effects most, so when we finally touched down we were all thankful to finally be here in this beautiful country. We had a late lunch at Snappa’s, followed by a nap, a couple of movie, then back to bed. It was the most sleep I’ve had in months. Much needed, and welcomed. Here are some photos of where we’re staying. The house is quite large with four bedrooms and three baths, and is literally surrounded by the ocean. As you can see, the weather is spotty, but things can change on a dime down here, so we know we’ll ultimately have a good day. The views are, in order, inside lower level, view from western deck, inside upper level, view from eastern deck. Beautiful. It is wonderful to be back in this beautiful country with our friends. I really, really needed this. So, Why Exactly Are We Going to the Bahamas? For decades now, biologists and others scientists often "band" birds to study their migratory patterns. The band is a harmless, small metal ring that fits around the bird's leg, and it contains a record which ties it to a database which contains all the information known about the bird at the time is was banded. Once recovered, information on its recovery can be reported (location, date, etc.) to study the specific bird's migratory patterns. As duck hunters, we sometimes harvest birds with bands. It is quite rare - every year less than 500,000 waterfowl are banded, and only 80,000 bands are reported. While the Yellow Dog Patrol was on its most recent southern engagement, I happed to shoot a hen pintail that was banded. I'm not proud that I shot a hen, especially on the last day of the season in the continent. That hen should be laying eggs in a prairie pothole somewhere this spring. It was a legal harvest, and in the first light shooting I truly believed I was shooting at a drake silhouette, but the fact that it was banded made up for my mistake some. So how rare is shooting a bird with a band? Since the 2000 season I've kept meticulous records of the harvest of waterfowl we've hunted - dates, times, number, species, etc. In just that time alone, from Canada to Louisiana, I've been there for the harvest of 951 various waterfowl, and witnessed only four bands recovered. One of my bands is a promotional one from my days working at Herter's. Two other bands are my dad's. The rest are mine, collected over 35 years of hunting. Reporting on Public Speaking - What Media Bias? Steve Sack, the Minneapolis StarTribune's resident editorial cartoonist weighs in today with an expected and tiresome knock on Sarah Palin for having crib notes on her hand. In the mean time, President Obama, the most gifted orator since Churchill, phonetically reads and mispronounces the title "corpsman" not once but twice in a recent press conference. The Palin example is everywhere. Obama's isn't covered. Why? Because the stories (or lack thereof) meet a media stereotype. Palin is a stupid hick that must depend on notes to say anything cogent. Obama is a brilliant, Spock-like presence who made just one tiny simple gaffe, likely because he was so exhausted from the months of working at a breakneck pace cleaning up the "mess that he inherited." Never mind that the Commander in Chief does not know a simple title of one of his command. Never mind that the substance of what is said, as long as it is delivered so eloquently and effectively. Last summer, a propane explosion took the life of a young worker at the Waconia Farm and Home Supply store. News details of the tragedy can be found here. I fully understand that this was the site of the biggest episode in the Fire Department's history. Also granted, I'm sure the Farm Store wanted to thank the Fire Department for their expert performance in containing the damage and destruction. But, folks, a local kid died less than a year ago. My God, did his parents receive this calendar? Did his friends? At its best, this calendar is ignorant, insensitive and classless. At its worst, it is creepy, macabre and ghoulish. 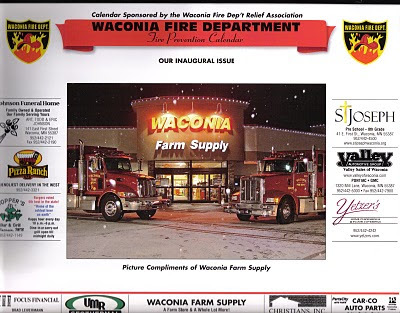 Shame on the Waconia Fire Department and shame on the Waconia Farm and Home Supply Store. As a marketer by profession, I pay close attention to the ads during the Superbowl. When done effectively, the notoriety around this advertising has created brands out of seemingly thin air, while ineffective ads find their brands panned for years. The stakes are high, as is the cost - the average 30 second spot cost over three million dollars this year. The Last Airbender - I'm not a movie guy at all, but this one has me pumped. Snickers - The Betty White ad was hilarious, and was likely the most entertaining of all the ads. Bud Light - Multiple ads worked great here, including the Bud Light house, the T-Pain voice, the asteroid situation, the plane crash situation, and the book club. Outstanding ads, all. Coke - The Simpson's spot and the African Sleepwalker spots were outstanding. They were incredibly well done, tasteful, entertaining, and aligned perfectly with the brand. Coke completely capitalized on Pepsi's sitting this one out, which likely was driven by Pepsi's massive spend for aligning their brand with the Obama campaign. Oops. Dr. Pepper - Little Kiss, an actual cover band (actually named Mini Kiss) paired with the full-size boys made for a memorable spot. Etrade - The spot where the baby gets questioned about his spending time with a "milkoholic" tramp was hilarious, and got the biggest laugh of the night for me. Google - The French girlfriend was perfect, showing the utility of their product while telling a nice story. Go Daddy - I'm really getting tired of Danica Patrick and the alluded lesbian encounters she gets herself into. It's not titillating; it's boring at best and crap at its worst. An aside: I find it funny that NOW gets so uptight about the Tim Tebow "abortion" ad yet lets this crap pass year after year. Nice priorities. Kia - The kids toys driving the Kia was a total miss. Who was the agency that thought that a good use of funds? Quilted Northern toilet paper bought a Superbowl ad. $3MM for a 30 second spot buys a lot of newspaper coupon inserts. A whole lot. I have a feeling a Marketing executive on their team might be looking for a new job in the near future. Dove for Men - In a day filled with beer, football, and girls, these guys are trying to sell beauty products for men. Someone needed to tell them that metrosexuality officially died in 2006. As stated in a previous post, I really like the Saints. I love the city, their people, their ownership, and their players. So it was a thrill last night to see the game that they produced. Brees was outstanding and put up a performance for the ages. In fact, if you consider the drops by his receivers, he was nearly flawless. The coaching was gutsy. From going for it at the end of the first half and getting stopped, to the huge call of an onside kick after halftime, the leadership was going to pull out all the stops to try and secure victory. Finally, the rest of the players came to play. Bush and Thomas carried the ball well, their talented receiver corps played a solid game, and Jeremy Shockey got a horrible monkey off his back with a critical touchdown. But by far the best moment was the genuine interplay between Brees and his son at the end of the game. That's a moment that will forever be replayed as Superbowl lore is reviewed. And for New Orleans, and the rest of us for that matter, that will be something to relish. I kind of have an issue with them billing themselves as The Who with Keith Moon dead since 1978 and John Entwistle dead since 2002. I know bands go on after personnel changes, but damn guys, the whole rhythm section is pushing up daisies. Why not bill as Daltrey and Townsend? Pinball Wizard was a huge mistake. If Daltrey can't hit the high notes anymore, just skip it. The light show was outstanding, and Townsend showed he still has significant guitar chops. When Pete Townsend's shirt came up during one of his patented windmill moves to reveal his dead-fish old man gut, I about tossed my football snacks. Who Are You and Won't Get Fooled Again were really solid. Of all the recent halftime performances, this was pretty darn forgettable. New Album from The Rocketboys Via Paste Magazine! Paste Magazine's VIP members get access to the full download of The Rocketboys' 20,000 Ghosts. The album is amazing, front to back, and for the price of a VIP membership it is a steal. Highly endorsed. The bonus album is from Alva Leigh. It was more hit or miss for me, but still a couple of fine downloads made it to my machine. Good stuff, people. Check it out. It was 30 degrees last night, and the deck had over a foot and a half of snow on it. In Minnesota, that means it was a perfect environment for grilling! A quick stop at the grocery store to secure some fine Angus steaks and fresh asparagus, combined with a really nice wine from the rack downstairs (John Gott 2005 Zinfandel) meant that the home team would be feasting restaurant-style right here in our humble abode. It turned out to be a fantastic dinner. As a reader of this space, you know that the Yellow Dog's job every morning is to fetch the paper, and the next morning was no exception. Unfortunately, the route she takes requires that she run right past the deck (and, subsequently, the grill) on her morning fetch, and sometimes the freshly-used grill just tweaks that incredible nose of hers and calls her in for a review of the situation. Hence, when I let the dog out, I figured her delay in returning had everything to do with the grill. When more minutes had passed, I knew something was definitely up, officially counted her as AWOL and went on a recovery mission. Luckily the package held, although how it resisted those motivated and razor-like canine teeth of hers remains a miracle. And a good thing too. You see, the Yellow Dog is pretty darn gassy just on standard Eukanuba. If she ingested fiber cereal, she likely would have had to spend the rest of the day in the garage until the flatulence storm had past. Dog ownership is never, ever boring. There's real reason for optimism, as the Twins sign Orlando Hudson to file huge holes at both 2nd base, and the 2nd position in the batting order between Span and Mauer. In one move they instantly got significantly better in two critical areas. The bad news? Our friend Nicky Punto and his .200 batting average is finally out of the picture as a full time second baseman. We're not completely out of the woods yet, though, as he'll be in the mix for 3rd base until (hopefully) we sign an additional player. This is a huge move, and gives us lots of reasons to be optimistic this season. If our pitching can hold, this lineup should be able to put up some good runs. Man, is spring here yet? Thank you so much for your concern in looking for a way to help us in this catastrophic situation. Everyday it’s death, horror, mourning and lamentation everywhere in Port-au-Prince. What you saw, what you heard on the news is nothing compared to what we are really experiencing: loss of beloved people, loss of courage, loss of control, loss of houses, properties and belongings acquired after unending years of work and suffering… How many others will dye in the aftermaths? I was in Port-au-Prince when it happened. From my desk I saw the annex of our house (the provincial administration office) collapse after being shaken violently. And seconds after, we were homeless like almost all the people living in Port-au-Prince. Yes, our main residence resisted the earthquake, but it is seriously damaged and it seems there are still many more to come. Thus, the great majority choose to sleep under the open sky, as it is advised. May God have mercy on us! For some of us, the members of our families are OK, others count some dead or injured. And our congregation in Haiti registered the loss of a scholastic killed under the rubble of what was the Center of Theology for Religious. Many young men and women of other congregations were killed, many old members too.. Many churches, schools, and public buildings collapsed, as you know well. As I wrote to others, this is an occasion to look at life with new eyes and to better appreciate God’s gifts to us. This is an occasion of a stronger solidarity between us. And to hear from our friends and confreres from all over the world, to know there are willing to support us in this situation is already a tremendous relief! While we pray to God for those who passed away, thanking Him for the life he gave to them, we also realize that our mission has become wider. More people than ever now depend on us for food, clothing, medicine, and even water. We cannot only concentrate on our own problem, even if they are many. We have to share the little we had been able to save with our most deprived brothers and sisters. And as the day go by, we expect to be solicited by more and more people. So if you can obtain us some support from the Pontifical Missions, it will help us keep for some time again the social and humanitarian dimension of our work as Missionary Oblates of Mary Immaculate. We can't imagine the devistation, suffering, and death. Like before, I'm asking you to give if you haven't already. Here's a link to the Oblates. It takes about a minute of your time, and your money can't go to a better cause. I've said it before, but as Fr. Gasner tells us, the suffering is immeasurable. Please give, and pray. Breaking News: 2010 Gopher Football Recruiting Class Mediocre. Again. Rivals.com ranks the Gophers as #50 in the nation with the latest recruiting class. That puts us at 5th overall in terms of ranking for the Big Ten. I guess the good news is that we're better than average. Slightly. But this is just another indication that Gopher football will continue its mediocrity for another couple of years, and likely in perpetuity. We don't cheat (booster support of cars or payments, academic looks of the other way, etc.) and when we do, we always get caught. Our weather flat stinks. How do you convince a top prospect from Florida or Texas that playing outside in 30 degree temperatures and living six months in a frozen wasteland is good? Gopher football means nothing here, unlike "only show in town" venues like Iowa, Nebraska, or Oregon. Coming here does not make you BMOC with all the requisite benefits. You're just another in a long line of losing football players. All of the above is endemic and permanent. We can't change any of it. And that means we'll forever be resigned to be challenging for the Motor City Bowl. And the Yellow Dog Patrol has been drawn! We're on for late April. We'll need warm weather, a flock of birds, and some luck, but we've had all three before. To check your own results, click here. The Yellow Dog team (minus any yellow dogs) made its annual trip south to visit the Black Dog Division of the Yellow Dog Patrol. We've returned with memories of many successful hunts, bags full of Louisiana boudin (thanks Doug), about five extra pounds, and my first duck band in over 10 years. Six years ago I was lucky enough to find a whole new line of my family. Through my engagements with them over these years I've found some incredible hunting, more laughs than one would think possible, and most importantly a whole new slough of people I love, and that love me back. It is said that God never closes a door without opening another, and the relationships I've been able to establish with my southern kin, all completed through my Dad's illness and death, proves that saying correct. They'll be more reporting on this trip, including a Louisiana duck hunting report, but right now the YDP is sleep deprived and behind on work. Look for more soon.